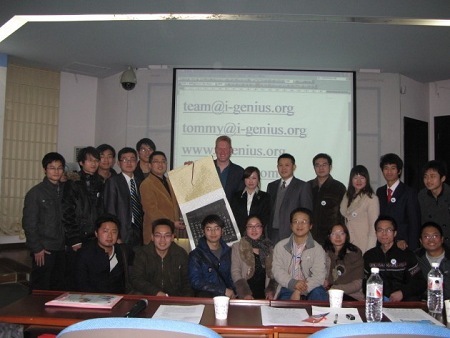 The i-genius team is always out and about jingling with people of all walks of life, but none more than our very own Founder and CEO, Tommy Hutchinson, who enjoyed a very successful social entrepreneur tour in Indonesia and China the past few weeks. Below are Tommy’s highlights in his own words. Tuesday 1st March – speak on social finance at the launch of the Arthur Guinness Foundation Challenge, WTC, Jakarta before going to Bandung to have dinner with hosts from Padjadaran University. Wednesday 2nd – speak at a workshop at a beautiful community center in Bandung followed by little kids trying to teach us how to make traditional toys (they were not impressed by my efforts!). Later visit a Rose farm in the hills. Sunday 6th – tour the Olympic stadium and Forbidden City – great! Monday 14th – final walk round the university and fly home. Didn’t want to leave! “My thanks to the people I met in Indonesia and China. Without exception, everyone was kind and generous. Thank you to British Council, the Universities, and other partners who hosted the tour. The interpreters all did a great job,” commented Tommy Hutchinson.